“I get to work daily with heroes that joined the military AFTER we were attacked on 9/11, AFTER the war started in Afghanistan and AFTER the war started in Iraq. I would like to think I’m that brave, but I’m not so sure." Somber tones invariably dramatize voice-overs that accompany videos looking back at the 1941 Army-Navy Game. The timbre also is heard in stories through the written word. The reasons are obvious: Eight days after No. 11-ranked Army beat Navy 14-6 on Nov. 29, 1941 before 99,000 fans in Philadelphia, the Japanese bombed Pearl Harbor. The day of infamy reduced to a footnote the result from the 1941 edition of the grandest rivalry in college sports. The seniors depicted in 1941 Army-Navy Game stories were rushed into the World War II effort, graduating a semester early. The underclassmen were soon to follow. The timing of the game and the Japanese sneak attack heightens the drama of such stories, but spare the somber tones for the 119th Army-Navy Game when the No. 23-ranked Black Knights (9-2) and Midshipmen (3-9) meet at 3 p.m. on Saturday at Lincoln Financial Field in Philadelphia. The uncertain future faced by today’s academy classes is the seemingly endless war on terrorism. It’s been that way since 9/11 terrorist attacks of Sept. 11, 2001. And modern academies better represent today’s America. It wasn’t until after World War II that President Truman desegregated the military. West Point and Annapolis didn’t dress their first black football players until the 1960s. Women weren’t admitted to the academies until the late 1970s. 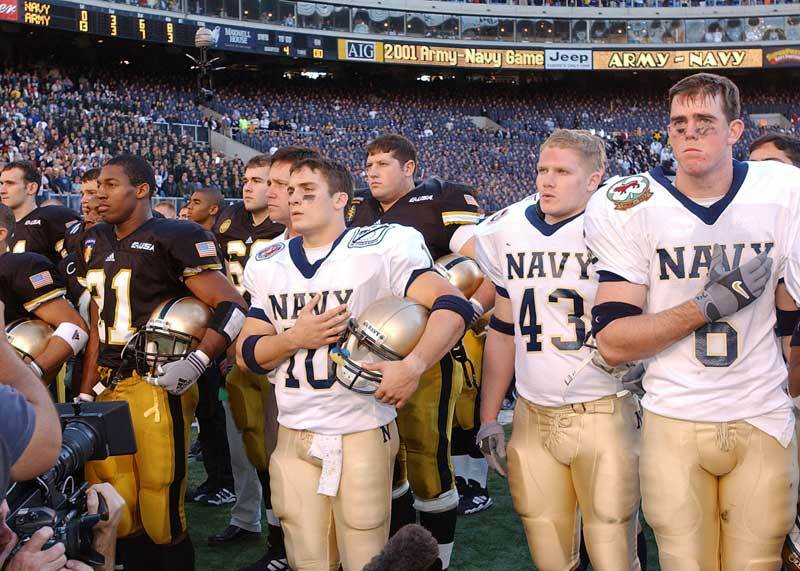 Yet as is the case with every Army-Navy Game since then, Army football players are among West Point seniors that routinely request Infantry as their service branch and Navy football players are among Annapolis seniors that routinely request Marine Ground as their choice between Navy and the Marine Corps. Pittsburgh Steelers offensive lineman Alejandro Villanueva, a West Point grad that served three tours in Afghanistan from the desert to mountain outposts, explains why. Villanueva said as a young cadet he picked up the attitude from mentors that balanced football and academics while pursuing an Infantry request. Two he mentioned were Matt Hernandez and Dominic Sintano. Navy grad and six-year NFL veteran Phil McConkey, who was the MVP of Navy’s 1978 Holiday Bowl victory and a wide receiver for the Super XXI champion New York Giants, has the utmost respect for modern classes. McConkey, who is now the president of Academy Securities, an investment firm that specializes in employing and benefiting veterans, points out he went to Navy after Vietnam. “I get to work daily with heroes that joined the military AFTER we were attacked on 9/11, AFTER the war started in Afghanistan and AFTER the war started in Iraq,” said McConkey, who flew helicopters during the Cold War. “I would like to think I’m that brave, but I’m not so sure. Two such seniors in this year’s game are Army third-year starting center Bryce Holland, Infantry, and Navy third-year starting defensive end Jarvis Polu, Marine Ground. Holland is among six branched to Infantry among 21 seniors and Polu among 16 in Marine Ground among 34 seniors. They exchanged their commitment for a chance to play Division I football and grew to accept the toughest and dirtiest branches. Annapolis graduates have a choice between the Navy and Marine Corps Ground. Polu was granted Marine Ground. Both fifth-year Army coach Jeff Monken and 11th-year Navy coach Ken Niumatalolo have seen this dedication play out class after class, year after year. Monken: “How much that our guys value being part of a team, how much they care about each other and the investment they make in each other are most prevalent in the Army in an infantry unit. That's a team. It's a group of men and women who must work together, cooperate, communicate, invest in each other and really be accountable to everybody else in the unit. Although the war on terrorism seems endless, classes between World War II and the 9/11 attacks also faced an uncertain future during the Korean War and the Vietnam War. Spare them the somber tones, too. Navy’s Roger Staubach and Army’s Rollie Stichweh are inextricably linked for their play as rival quarterbacks in the epic 1963 and 1964 Army-Navy Games. Both served in Vietnam. The 1963 contest was almost canceled after President John F. Kennedy was assassinated in Dallas, but President Kennedy’s widow, Jackie, and his brother, Bobby, said Kennedy, a World War II hero as a Navy PT boat officer, was a big fan of the Navy football; he would have wanted the game played. JFK had attended in 1961 and 1962, participating in the ceremonial coin toss, and planned to again in 1963. That 64th edition was pushed back a week as Navy, ranked No. 2 in the nation, and Army met with a Cotton Bowl bid on line opposite No. 1-ranked Texas. The crowd of 100,000 fans at the Philadelphia’s cavernous Municipal Stadium was quiet at first, but emotions soon overflowed. Staubach, who was in New York a week later to accept the Heisman Trophy, led Navy to 21-15 win with a spell-binding finish. Stichweh drove Army to the Navy 2-yard line but was unable to call a play above the crowd’s deafening roars as time expired. A year later, Stichweh and his teammates gained redemption in another dramatic finish. Army’s 11-8 win was played before another crowd of 100,000 in the same edifice that by then had been renamed JFK Stadium. At the time that Staubach, Stichweh and their classmates enrolled at their academy, Vietnam was a country known only to political scientists studying its consequences in the Cold War. That soon changed. Stichweh’s Vietnam tour overlapped the 1968 Tet Offensive. He was twice decorated for valor while serving with the elite 173rd Airborne Brigade in the Central Highlands jungle along the Ho Chi Minh Trail. “When my Army teammates and I were in high school, Vietnam was not on anyone's radar screen,” Stichweh said. “It was a subject never mentioned because no one anticipated what would occur only a few years later. Staubach, who was drafted by the Dallas Cowboys and won two Super Bowls upon resuming his football career, could have sought assignment in the United States, but he asked for a Vietnam tour. While stationed at Chua Lai, mortar attacks sent him diving for cover in bunkers. One day he learned of the death of one his teammates, Tommy Holden, a starting guard and linebacker. Staubach and Stichweh both lost other classmates. But such dedication extends beyond football players. They are only the highest profile of the academy grads while playing in the grandest rivalry in college sports. Dawn Halfalker was an Army women’s basketball player that set a West Point record for steals in a season. In 2004, Halfaker lost her right arm while serving as a lieutenant in Baqouba, Iraq. She was the commanding officer of four soldiers in an armored Humvee when insurgents fired upon them with a rocket-propelled grenade. She was severely wounded, but she was composed from her West Point training, shouting at the driver to “get out of the kill zone.” The driver found cover; she was bleeding profusely when medics arrived. When Army recruited Halfaker, who wasn’t from a military family, the 9/11 attacks were in the future. But the fate she experienced hasn’t changed her attitude toward a commitment made during a peaceful time and the transition to serving in a war zone. In 2006, she founded one of the nation’s leading defense consulting businesses in the nation, Halfaker & Associates based in Arlington, Va. The West Point campus in New York and Annapolis campus in Maryland are separated by 266 miles, but the stories of Holland and Polu meeting in their final Army-Navy Game exemplify the Cadets and Midshipmen are of the same mindset. Holland committed as a high school junior as a 3-star-ranked recruit, a rarity among Army football classes. He had been drawing interest from Power 5 schools until ending the recruiting process early. Former Army assistant coach Andy Guyader, who coached Villanueva at West Point, recruited Holland out of Hamilton High in Chandler, Az. Holland started two games at the end of his freshman year, including the Army-Navy Game, before missing 2015 with a knee injury. He has returned as a three-year starter and two-time Rimington Trophy candidate, but even if an NFL opportunity had developed, he has no regrets. Polu had originally committed to West Point out of Liberty High in Las Vegas with plans to follow his father, who served in the Army 25 years as an E7 non-commissioned officer. But when former Army coach Rich Ellerson was fired, Polu’s Samoan parents, To’oto’oali’ and Seepa Polu, asked him to take another look at Niumatalolo and Navy. They trusted Niumatalolo, who was the first Samoan college football head coach upon promotion from Navy’s offensive coordinator for the 2008 season, to watch over their son. Niumatalolo was enshrined in the inaugural Polynesian Football Hall of Fame in 2014. “After this year, he’ll go back to rooting for Army,” Polu said of his father. But the point is Polu experienced basically the same culture of service in Annapolis that he expected to find at West Point. Not much changed but the colors of his uniforms – football and otherwise. It’s a message Staubach emphasizes in his travels, particularly when he meets Army players or fans. He reminds them they are only opponents one day a year. When the 119th edition ends, tradition holds that the teams stand with each other during the singing of their respective alma mater. The winning team earns the coveted right to sing second. Outside of the football arena, Holland, Polu and their respective teammates stand committed to the same team.